Roe Head - Built on land bought from the Armytage Kamily of Kirklees Hall in the mid-17C and rebuilt in 1740. 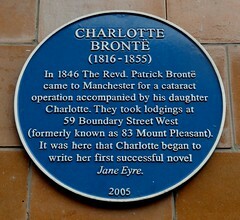 The building became a school in 1830, attended by the Brontë sisters, Charlotte, 1831-32, Emily, 1836, Anne 1836-7. Charlotte returned in July 1835 as a teacher. Headmistress of the school was Margaret Wooler (Mrs Prior in Shirley) and Charlotte's Friends at school were Ellen Nussey and Mary Taylor (Caroline Helstone and Rose Yorke in Shirley). The George Inn. In Elizabethan times Ralph Rokeby Esq. (d. 1575) secretary of the Council of the North lived in a house on this site. 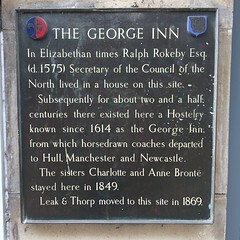 Subsequently for about two and a half centuries there existed here a Hostelry known since 1614 as the George Inn, from which horsedrawn coaches departed to Hull, Manchester and Newcastle. The sisters Charlotte and Anne Brontë stayed here in 1849. Leak & Thorp moved to this site in 1869. 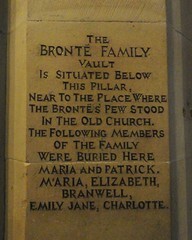 The Brontë family vault is situated below this pillar, near to the place where the Brontë's pew stood in the old church. The following members of the family were buried here: Maria and Patrick, Maria, Elizabeth, Branwell, Emily Jane, Charlotte. This was the site of the gate leading to the church used by the Brontë family and through which they were carried to their final resting place in the church. 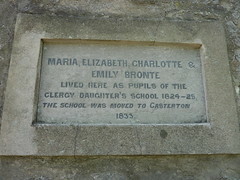 Charlotte Brontë (1816-1855) taught at this school built in 1832 and restored by the church in 1966 with help from the Brontë Society.